Grid connect solar system benefits are obvious when your solar panels are producing more power from the sun than the home is using; the excess flows out onto the grid and your electricity meter effectively runs backwards. You get a credit on the meter for use of that power later! We can arrange this with your electricity supplier. 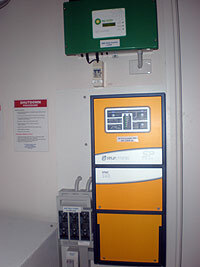 Uninterruptible Power Supply (UPS) option secures house loads even when the Mains power fails. 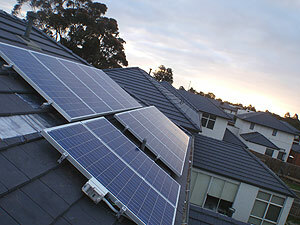 We have designed, supplied and installed hundreds of grid connect solar system residential systems in all areas of Victoria. We assist you with your applications to the relevant Government bodies, Incentives and the power companies. We take the frustration out of installing grid connect solar system to your home providing clean safe electricity for your appliances. 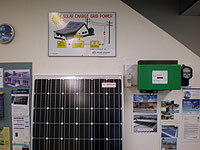 You are welcome to visit our Grid Connected showroom to see the grid connect solar system and discuss your needs. View our live office system output. Come in on a sunny day and watch our electricity meter run backwards! Choosing solar electricity power for your residence is a great way to do your bit for the environment and significantly reduce your power bills. Click here to view our live office system output. An uninterruptible power supply or UPS is an electrical apparatus that provides emergency power when the mains power fails. "I was keen to put a grid interactive solar system"
"I was keen to put a grid interactive solar system into my new house and got together with the team from Solar Charge to work it out. To me this is the way of the future. This grid connect solar system is for the sake of our Planet, we cannot burn fossil fuel forever." Testimonial: "The system is working just as you said it would"
This is just a short note to let you know how pleased I am with the service provided by your company. Apart from the quality of the system, factors that influenced my decision included the patience you personally showed to my continual questions and requests for information, the comprehensiveness and candour of your responses, the absence of any "hard sell" approach to your interaction with me, and the obvious deep commitment to the environmental issues underlying solar power displayed by you and your company, which contrasts with what seemed to be the main motivation of a number of your competitors. We haven’t had much sun in the days since it was installed but the system is working just as you said it would and I have seen my meter running backwards a few times which is psychologically most satisfying.